The 2018 general election is just over a week away. The Alaska political landscape is about to undergo a big change. We will have a new governor. There will be at least ten new house reps, a 25% turnover. And at least four new senators, a 20% turnover. Both of those numbers could be higher if incumbents are defeated. Depending on how some races go, the power balance in the house or senate could change. We will soon know what our legislature will look for the next two years. If you did not see the video profile we did of the District 5 race between incumbent Adam Wool and challenger Kevin McKinley, check it out here. Stay tuned for our profile on the senate race in Fairbanks that everyone is talking about. Pete Kelly vs. Scott Kawasaki. 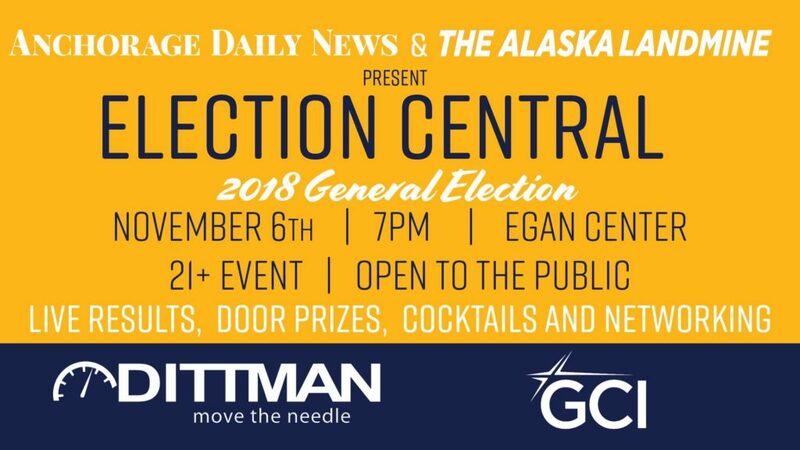 Don’t forget about Election Central at the Egan Center! It’s going to be lit. A big thanks to GCI and Dittman Research for sponsoring. Click here to respond to the event on Facebook. I would like to thank all of you, the readers of the Alaska Landmine. It has been a year since I started it when I got back from Australia. It has been a lot of work and a ton of fun. It makes me happy to know how much we have grown and how many readers and supporters we have. This is what keeps me going. Thanks to everyone who have sent me tips and info. And a big thanks to Cale Green, Paxson Woelber, Allison Hovanec, Corinne Graves, Lee Baxter, and all the members of team Landmine. It would not be possible without all of you. Here’s to another year. There were some high profile debates this week. 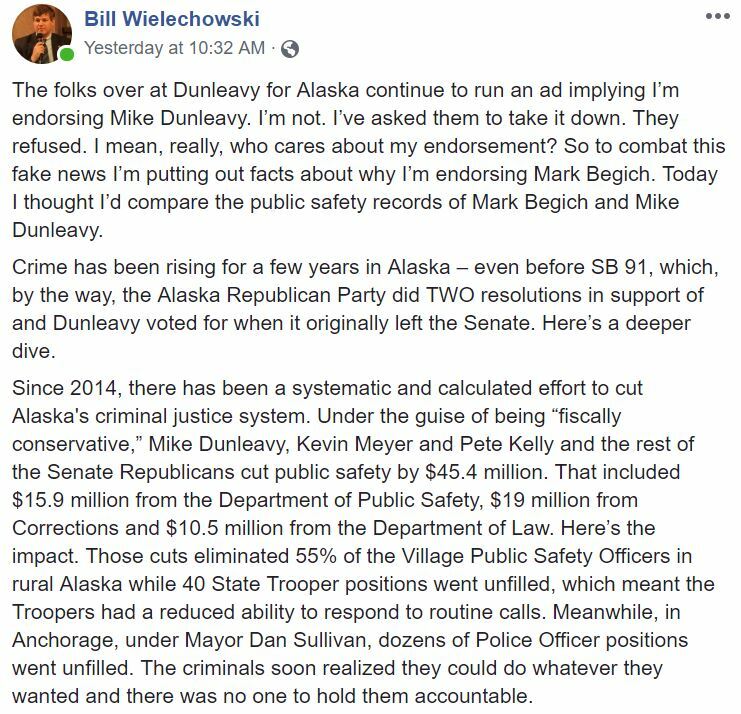 Mike Dunleavy and Mark Begich squared off in Fairbanks on Wednesday (10/24/2018) at the Alaska Chamber conference. Dunleavy opened by saying, “I just want to let everyone know that I’m here, at this debate. Mark, I’m here. 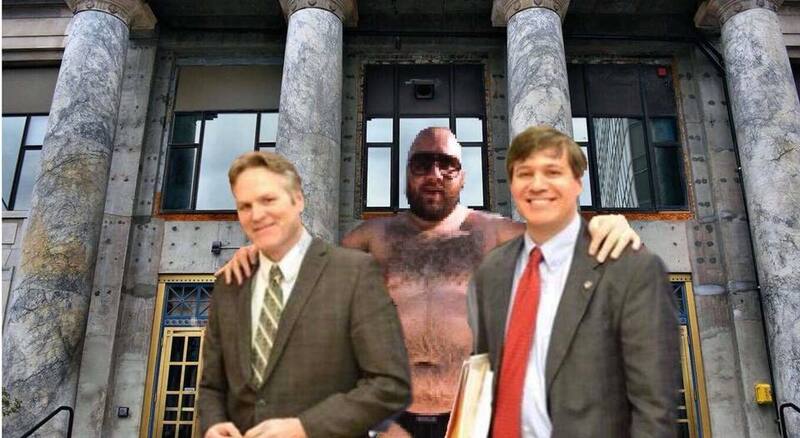 Next to you.” Begich responded by saying, “Mike, I’m glad you’re here. Missed you yesterday at the youth vote debate with Channel 2. But that’s another story.” Damn. Click here to see that debate. The two then appeared at a KTUU debate on Thursday (10/25/2018) that was co-hosted by Alaska Public Media. 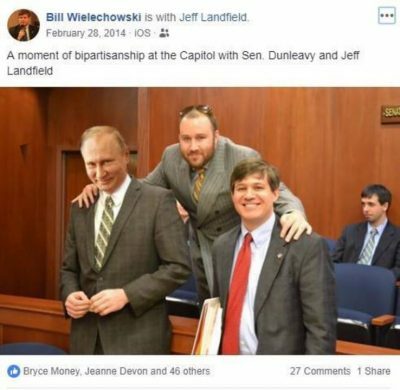 Dunleavy looked like a giant next to Begich. Overall not a very exciting debate. Click here to see that one. 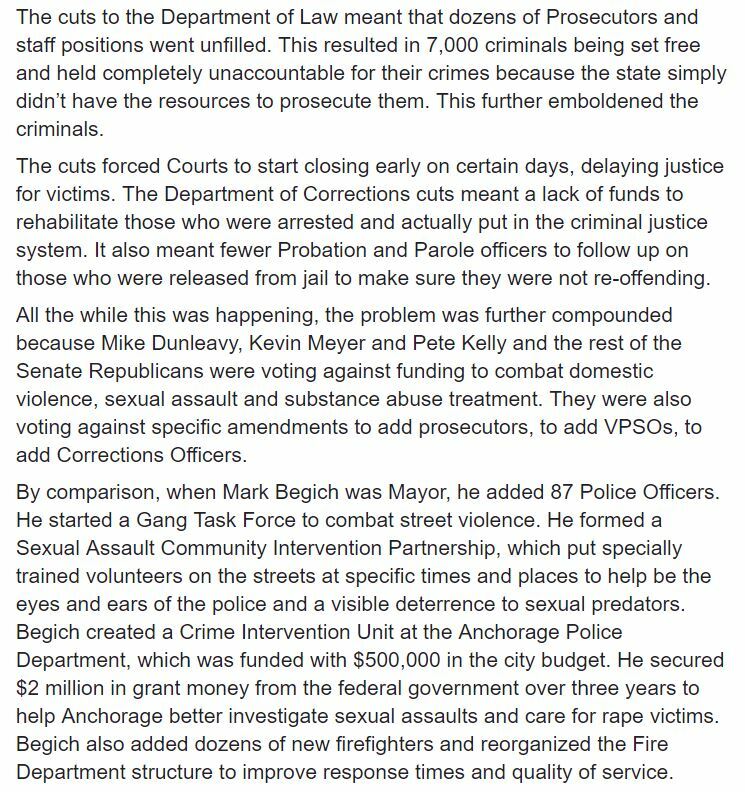 Mark Begich had some drama on his way to that debate. Apparently he stopped a fight near Crossroads! According to a witness, he was at the stop light on 13th and Gambell. Some guy ran into the street with a guy chasing after him. The pursuant started kicking and hitting the other guy. Another person was trying to stop it. They had all been drinking. Begich moved his car between them and prevented the other cars from moving forward. He rolled down the window and told them to break it up. As he was getting out they stopped fighting. The guy trying to help said, “Sorry boss.” The dude getting beat up said, Sorry, Mr. Begich.” He told them to go in separate directions, which they did. Then Begich got pulled over! The cop thought he was involved in the fight. 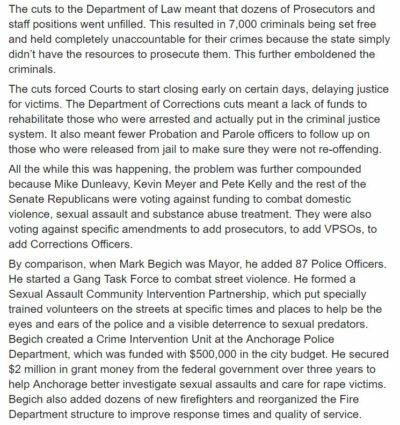 Begich explained what happened and said he was late for a debate about crime. Maybe the two were fighting about the governor’s race. Welcome to Anchorage. Don Young and Alyse Galvin squared off on KTUU on Friday (10/26/2018) night. This debate was also co-hosted by Alaska Public Media. This one was one to watch. Like Don Young or not, he answers questions and you know where he stands. Galvin not so much. Young and KTUU reporter, Rich Mauer, got into it when Mauer asked him if his use of the term “the big enchilada” was intentional. Young said it in reference to the caravan of people from Honduras about when they show up at the border. Young shut him down by saying it was not, and then said, “I’ve watched you over the years attack Ted Stevens. And you attack me all the time. It was not intentional.” Mauer responded, “Am I like the national media to you?” The moderators intervened and stopped the interaction. Then it got real good. 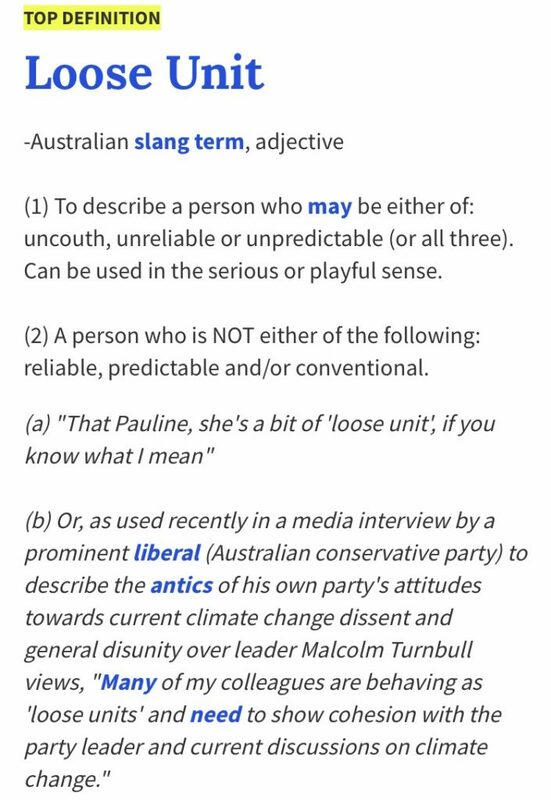 Galvin interjected and said, “I know that he has also used the term ‘wetbacks’ in the recent past.” Then she goes on to talk about using appropriate language. Talk about loose! You can see that debate here. Speaking of Alyse Galvin, check out her federal financial disclosure. Whoa! Who wants to bet she introduces a student loan forgiveness bill if she wins? It’s a real good one this week. This week’s Loose Unit is my longest and most reliable advertiser, the independent expenditure group Dunleavy for Alaska. The good news is the election is in a week and they are all paid up! It all started when the group put out a video with audio from Senator Bill Wielechowski (D – Anchorage) talking about how he likes Mike Dunleavy and misses him in the senate. You can see it here. 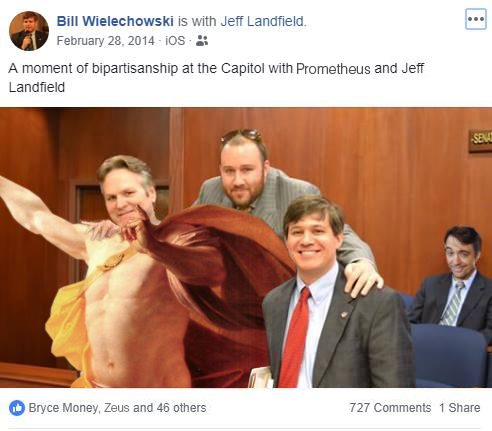 In the video, they used a pic of me with Dunleavy and Wielechowski that was taken on the senate floor back in 2014. That alone was not that loose. 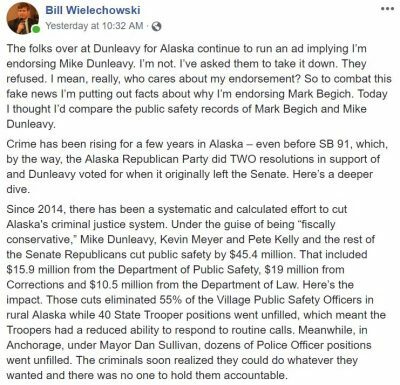 It’s actually a smart move considering Democrats are trying to paint Dunleavy as an extremist. Obviously, Wielechowski was not happy about it. He asked them to take it down, which they did not. He then made this Facebook post. Dunleavy for Alaska then got real loose and doubled down. They turned Wielechowski’s comments into a radio ad and also posted it on their website. So loose. But the loosest thing was what they did to my picture. They went full Joseph Stalin and photoshopped me out! Leaving Bill and Mike looking real chummy. The doctored image of the two is featured prominently on their website. Having no other choice than to respond, I posted this on Facebook. Thank god for the internet. People then started sending me their own photoshop work of the picture. Here are my favorites so far. A little Putin and a lot of speedo! What may be the loosest part of all of this is how Alaska it is. 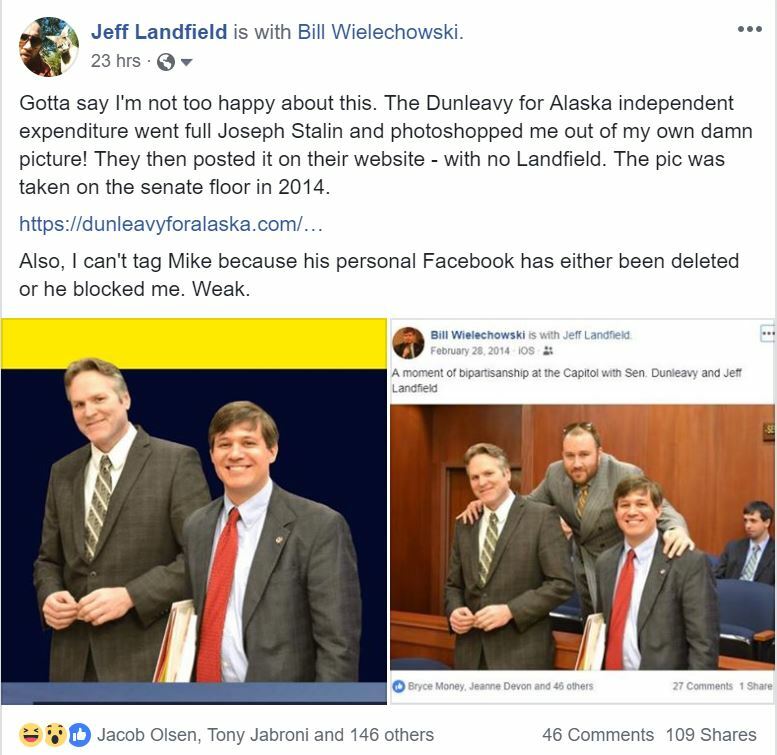 My two good friends, and members of team Landmine, work for Dunleavy for Alaska. Talk about loose! It’s all in good fun though. I’m just happy to be in the middle of it all. At least I was before these Loose Units photoshopped me out! Alaska is a small place. 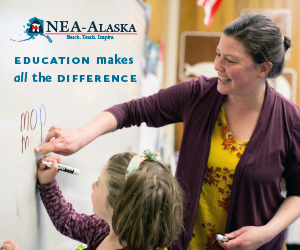 But Alaska politics is even smaller.